Linsar unveils new 24in LED TV with built-in soundbar | What Hi-Fi? If you want to boost the sound of your flatscreen TV and haven't been sold by the idea of speakers and cables placed around your lounge, a soundbar or soundbase is seen as the best way forward. Even then, the notion of purchasing a separate piece of kit to sit beneath your screen might feel a little confusing with the selection of soundbars now available. And that's where Linsar is hoping to make it easier. The British TV manufacturer has announced the introduction of the X24-DVD – a new "ultra slim" 24in LED TV that includes a soundbar built into its stand and is designed to deliver "high quality HD sound". 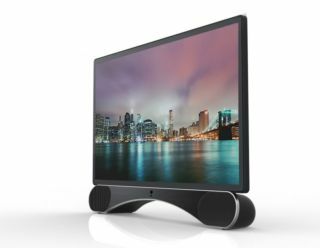 According to Linsar, the X24-DVD is targeted at young viewers seeking "better sound from watching music channels" or playing tracks from a mobile device, with the set incorporating Bluetooth connectivity. The company also says that customers with hearing issues will benefit from the louder sound the TV can offer through the soundbar. Other features include a Freeview HD 1080p tuner and side-mounted DVD player. One of the last times we cast our eye over a Linsar TV was back in 2012 with a 22in LED screen, which impressed us with its picture and affordable price. Now available for £300, the X24-DVD is no doubt seeking similar plaudits.